Watching The Dark Knight on the IMAX was an almost religious experience for cinemagoers. To shoot the sweeping vistas for the gigantic cinema-screen chain, director Chris Nolan had to get to grips with the clunky cameras adapted to take 70mm film, which is used to present the movie in an IMAX-specific 1.44:1 aspect ratio. 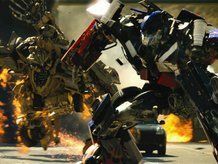 Now Michael Bay is getting in on the action and shooting selected scenes of the upcoming Transformers sequel, Transformers: Revenge Of The Fallen, for the IMAX. Speaking about the chance to film specifically for the IMAX, Bay said: "The extraordinary level of detail and intensity captured by the IMAX camera creates many exciting possibilities for us with this film." "IMAX's all-encompassing format will take this story to a new level, and I am once again very excited to share The IMAX Experience with Transformers fans around the world." Transformers: Revenge Of The Fallen will hit cinemas in June next year. If the success of The Dark Knight on the IMAX is anything to go by, we recommend you book your tickets now!